The site for all things Gaming in Utah. New Point System! Reputation/Levels/Name Colors/Ranks/Pranks Now Possible! Go to the News & Notifications thread to see what it's all about! A Vampire MMORPG, similar to Diablo. Click & Slash, you have 3 races to pick from and around 15 classes. The game is Free-to-play! 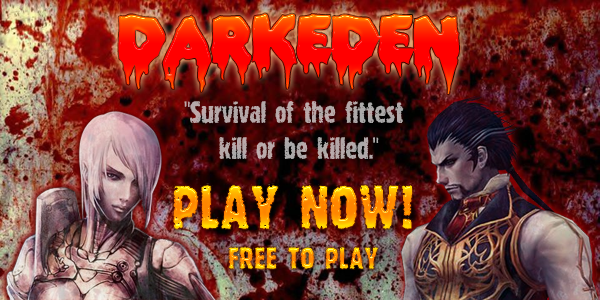 Darkeden is daylight based, meaning there's a 24 hour day that shifts from day to night. At night vampires are stronger, and at day "slayers" (humans) are stronger. Maximum level is 250. Can drink blood to regain hp, can regenerate from damages such as bullet wounds etc. Can turn into a bat, a wolf or a werewolf( lycan). Mage vampires = Most known for their torture skills such as blinding spells, paralyze. They can keep you alive just to play with you till they've had enough. Only then will they kill you. Melee vampires = Fast & strong beings whos claws can cut through steel plated armor, bullets are rarely enough to stop one of these. You'll need a rocket launcher. But be careful because they're very fast, hard to hit them. There's 4 classes of ousters to pick from. ouster that can take a lot of hits. Air/combat ouster = The hand-to-hand combat ouster who prefers a circular blade to slice enemies. Can move extremely fast and summon razor blades from the sky. Gunner = Uses automatic rifle, sniper rifles, smg etc. Can call for satellite bombs and XL rockets to blast enemies to tiny pieces. Can also turn into a a powerful turret, that is unmovable but with insane firepower. Sworder = Uses sworder & shield, can move faster than the eye and slice anything. Blader = Uses a big sword, one swing is enough to create a hurricane. with a lightning bolt from the sky. Enchanter = A powerful magician that can buff your allies to see invisible vampires, and trap them in powerful spells. This is a interesting game with one rule, survival of the fittest. Create a clan, and beat your enemies. Drain their blood or just keep them trapped in powerful spells till they beg you to kill them. Is this an ad or you really from Utah? "With this sword infinity has no limit and in these hands I will reach beyond that!" Location : The planet's core. I give you props for detail and layout of your comment looks nice.